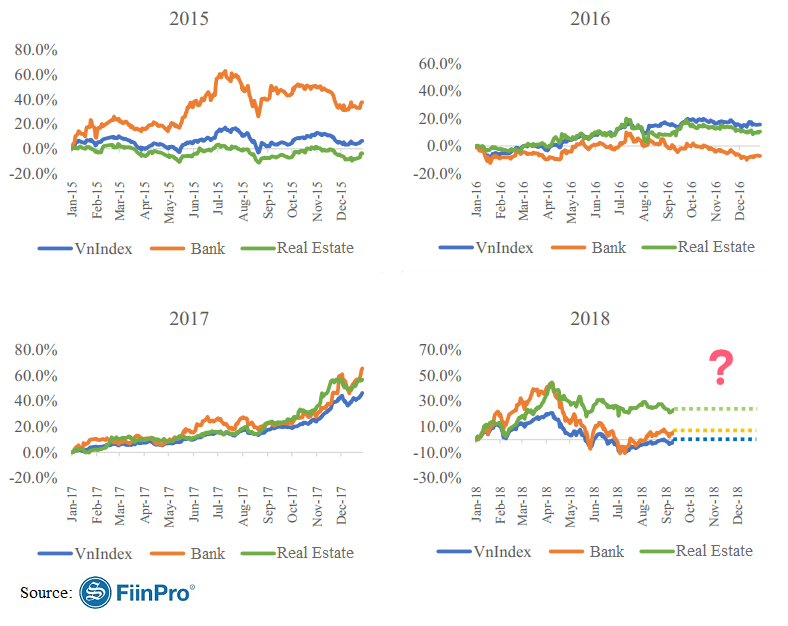 FiinPro - Which scenario that can be predicted for banking stock and real estate toward the end of 2018? Which scenario that can be predicted for banking stock and real estate toward the end of 2018? Banking and real estate stocks are considered to be the dominant stocks in the market accounting for 40% of total market capital. Any movements of these 2 stocks might also affect essentially and lead to the change of Index statistics. In the first 9 months of 2018, banking industry has rapid growth of 6.5% while the real estate category tremendously increases its growth rate at 23.7% and seems to have equal direction in the last 03 months. While macroeconomic indicators are forecasted to be positive in the upcoming quarters, numerous questions have been raised to evaluate the business outcome, the progress of bank and real estate stocks at the end of 2018, the policy that controls credit growth at 17% and tighten credit for real estate under Circular 19 of the State Bank recently. To thoroughly address these questions to investors, StoxPlus organize a conference: FiinProTalk#7: "Banking & Real Estate Stocks: Closing for 2018 & Outlook"